Deval Patrick has largely shunned politics since leaving office in 2015. 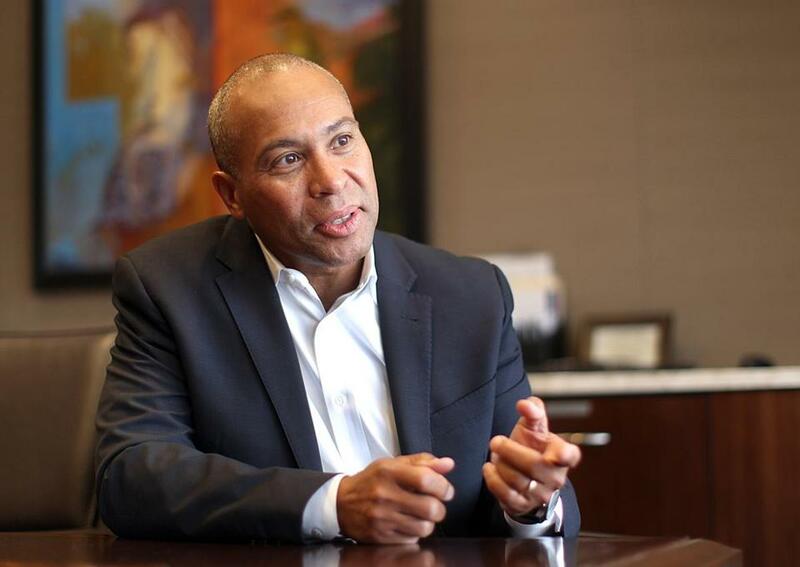 Deval Patrick, the former governor of Massachusetts who has largely shunned politics since leaving office and joining Bain Capital in 2015, is using some of his most direct language to date to acknowledge his interest in a presidential run in 2020. Patrick also spoke to the editorial board of the Kansas City Star about the polarized gun debate in the wake of the massacre in Parkland, Fla. But his comments about running for president are likely to gain the most attention, as Democrats continue to cast about for a candidate who can effectively challenge President Trump. David Axelrod and Valerie Jarrett, two former advisors to President Obama, are among those who have encouraged Patrick to consider running for the White House. Patrick, who served two terms as governor and was the first African-American to hold the job, has largely avoided politics since 2015, when he joined Bain Capital, the investment firm founded by his Republican predecessor, Mitt Romney. But in December, Patrick spent a weekend in Alabama campaigning for Democratic Senate candidate Doug Jones, days before Jones defeated Roy Moore. This month, Patrick tweeted for the first time in nearly three years to promote a podcast he recorded with Jennifer Granholm, the former Democratic governor of Michigan, in which they discuss a subsidized birth control program that has helped reduce teen birth and abortion rates in Colorado. On Monday, Patrick spoke to the American Israel Public Affairs Committee, the influential pro-Israel lobby in Washington. In a brief address, he touted his two trade missions to Israel, and the strong ties between Massachusetts and Israel. Speaking to KCUR, Patrick said he wants to campaign for Democrats running for office this year, and will travel where the party believes he can be helpful. Patrick, while saying he supports tougher gun laws, also made some unusual comments showcasing his familiarity with firearms.